The Earth’s ecosystems are in the midst of an unprecedented period of change as a result of human action. Many habitats have been completely destroyed or divided into tiny fragments, others have been transformed through the introduction of new species, or the extinction of native plants and animals, while anthropogenic climate change now threatens to completely redraw the geographic map of life on this planet. The urgent need to understand and prescribe solutions to this complicated and interlinked set of pressing conservation issues has lead to the transformation of the venerable academic discipline of biogeography – the study of the geographic distribution of animals and plants. The newly emerged sub-discipline of conservation biogeography uses the conceptual tools and methods of biogeography to address real world conservation problems and to provide predictions about the fate of key species and ecosystems over the next century. This book provides the first comprehensive review of the field in a series of closely interlinked chapters addressing the central issues within this exciting and important subject. View www.wiley.com/go/ladle/biogeography yo access the figures from the book. Richard J. Ladle was the founding Director of Oxford University’s MSc in Biodiversity, Conservation and Management. Since 2009 he has been working in Brazil as an international conservation consultant and science writer. He is currently a Visiting Professor at the Federal University of Alagoas, teaching and doing research on diverse and interdisciplinary aspects of conservation, biogeography and ecology. Robert J. Whittaker is the current Academic Director of the MSc Biodiversity Conservation and Management, and holds the title of Professor of Biogeography in the School of Geography and the Environment, University of Oxford. He is a founding member and past President (2009–2010) of the International Biogeography Society. He is currently editor-in-chief of the Journal of Biogeography. He has a long-standing interest in island biogeography, patterns and processes controlling diversity, and the application of biogeography to conservation. 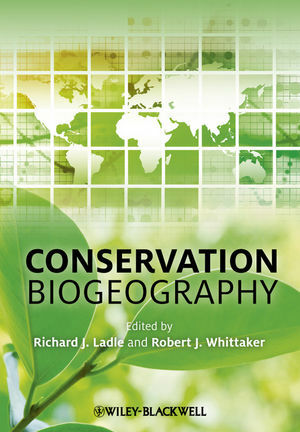 1 The roots of conservation biogeography (Robert J. Whittaker and Richard J. Ladle). 2 Social values and conservation biogeography (Richard J. Ladle, Paul Jepson and Lindsey Gillson). 3 Base-lines, patterns and process (Lindsey Gillson, Richard J. Ladle and Miguel B. Araújo). 4 Basic biogeography: estimating biodiversity and mapping nature (Brett R. Riddle, Richard J. Ladle, Sara Lourie, Robert J. Whittaker). 5 The shaping of the global protected area estate (Paul Jepson, Robert J. Whittaker & Sara Lourie). 6 Systematic conservation planning: past, present, and future (James E.M. Watson, Hedley S. Grantham, Kerrie A. Wilson and Hugh P. Possingham). 8 Applied island biogeography (Kostas A. Triantis and Shonil A. Bhagwat). 9 Biological invasions and the homogenization of faunas and floras (Julian D. Olden, Julie L. Lockwood, and Catherine L. Parr). 10 Prospects and challenges (Richard J. Ladle & Robert J. Whittaker).